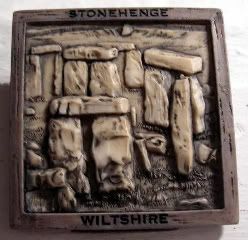 I've never been to Stonehenge, but my sister did, and she's the one who brought me this magnet. I was planning on going on this last trip, but decided to wait until they start and complete the renovations on the visitor center. And hopefully, they'll be including a revamped website, complete with a Google search term package...it shouldn't be this hard to get information on what's going on with their capital campaign and where they are with design, etc. Jeepers. I mean, could English Heritage make themselves harder to find? I seriously spent 10 minutes trying to find them online! Anyway, totally going. Apparently, they have this supercool, superspecial tour that allows you to go monkeying around among the stones! Right now, you're allowed only so close to them, but not allowed to touch. The supercool tour? Lets you go superearly in the morning, and frolic among the wee folk. Well, I'm not sure if frolicking among the wee folk in the wee hours is such a good thing to be doing out there - who knows what magix might occur with frolicking among the stones. Or maybe you have to be nekkid for something to happen. Yes, I may have read one too many supernatural romances set in England. What I want to know is, how come when they talk about the Old Folk - the elves and fairies and dwarves, etc. - how come they're all in Europe. Why don't we have any Old Folk in the US? In fact, the Philippines actually has folklore dealing with the Old Ones...there's a belief that you should always leave one or two grains of rice on your plate, so that the fairy folk (or whatever they are in the Philippines) can take them. I could swear there's another belief about being careful when you sweep the dust off your porch, for fear of hurting the Old Folk. But I don't think that's Filipino. Though my mother also likes to wave out the back window from the kitchen table, whenever she's eating - as a sign of respect to the fairies that are hanging out in the woods back there. Honestly, I just think she's really waving at the hunters in the deer stands, in case they're out back....well, hunting. Or, she's just being Mom.